2017 New 4Bed/3Bath, Prime Location - Air Conditioner! Beautiful new home, built June 2017. Located at a very prime location at the heart of South Lake Tahoe. Home has great amenities: Spa, Pool Table, BBQ, Poker Table, HDTVs, and more! Short walk to bike shops, some shops and restaurants and lake. * Large flat screen HD Smart TVs throughout home. Connect your smart phone/ipad or use our free Amazon, Netflix, Spectrum Cable accounts with HBO, etc. Location, location, location!!! 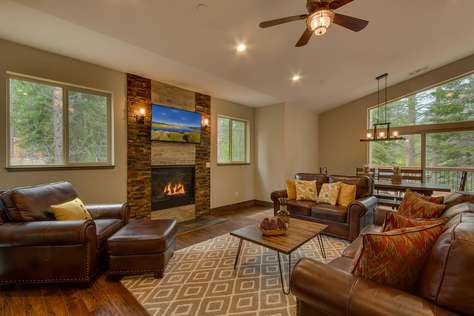 This brand new, beautifully built and professionally furnished new home by Tahoe's finest interior decorator with a Mountain Modern theme is centrally located in the heart of South Lake Tahoe. It is a large 4 bedroom home with 3 full baths. Sleeps 12 comfortably. Less than 1/2 mile from beach. Less than 5 minute bike ride to closest beach. There are bicycle rentals all over town and great bike trails for kids and families. 3 miles to Heavenly Ski Resort and Stateline, NV casinos. 1/2 mile to closest beach. Drive to Heavenly 5 minutes. Uber to Heavenly and Casinos is about $15. Or take a 10 minute bike ride. There is an awesome bike path 1 block from our house to easily bike to some great places around the lake. The bike trail is baby trailer and child friendly. The closest beach is a 2 minute bike ride. Or bike to Camp Richardson Beach which is an awesome beach, 15-20 minute bike ride away. Cleaning Fees include in price many extras : jacuzzi service prior to arrival, starter kit of basic supplies such as shampoo, soap, dishwasher detergent, toilet paper, bath towels, paper towels, etc. Laundry detergent is not provided. Home has great amenities: Private Hot Tub, BBQ, Game Room, HDTVs, and more! You'll want to pinch yourself but don't worry, you're not dreaming. This beautifully appointed newly built 4 bedroom/ 3 bath has a contemporary rustic industrial design. Park your autos in the oversized two car garage then head inside to find stunning details in every direction including a two-tone stacked stone fireplace, Edison bulb light fixtures, and glass backsplash just to name a few. The kitchen is nothing shy of gourmet with stainless Samsung appliances and tons of counter space. The chef will also be able to take in the view of the tall pines that surround the property from the oversized kitchen windows. 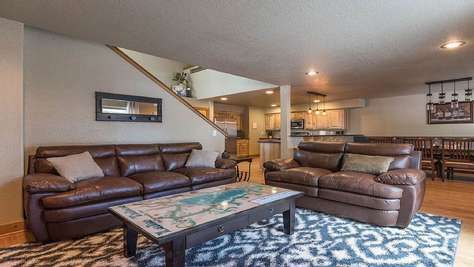 While entertaining, your guests you will enjoy the large comfy sofa seating upstairs adjacent to the kitchen. A large HD flat panel television is mounted directly above the gas fireplace. When the weathers right, enjoy the expansive deck complete with BBQ and dining table. If anyone in your group goes missing, there's a good chance you'll find them in the downstairs second living room. This room has it all including large smart flat panel television hung above a gas fireplace, foosball table, and a queen sleeper sofa. Step outside through the sliding glass door to find a large sunken covered spa. Explore the neighborhood and you'll find the Y area with its numerous shopping outlets, Raley's grocery store, BevMo liquor store, ski rentals, and more. Camp Richardson is just a few blocks in the other direction. An abundance of great restaurants and bars dot the surrounding area. You'll also be close to some of the best BBQ in town at Sonney's BBQ Shack, hardly a shack though. Guests will find this home centrally located just minutes away from all the action. You're less than five miles to Heavenly and just 1 mile to Camp Richardson. This property is also within one mile of numerous restaurants and bars such as Sonney's BBQ Shack, Cantina Bar & Grill, and the Burger Lounge. Raley's (grocery store) is also less than one mile away. Cleaning Fees include in price many extras : jacuzzi service prior to arrival, starter kit of basic supplies such as bath towels, face cloth, shampoo, soap, dishwasher detergent, toilet paper, paper towels, etc. Laundry detergent is not provided. Beach towels are not provided. 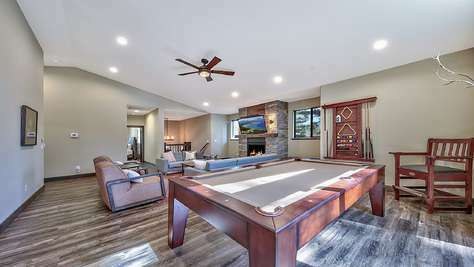 You'll feel right at home in this newly built 4 bed/ 3 bath home complete with a shuffleboard table and an arcade. Built in 2017 and perched at nearly 6,800 feet in elevation, this totally custom home makes quite the statement. The owner has thought of everything, outfitting the entire home with contemporary furnishings and numerous high-end amenities. Upon entering, you notice no expense was spared. Knotty pine cabinetry and accents adorn the kitchen/ living/ dining rooms. The gourmet kitchen boasts a living edge granite countertop complete with breakfast bar. Stainless appliances and plenty of space round out the gourmet kitchen. The large living room with its stacked stone fireplace with flat screen television mounted above is sure to be the perfect area for just about any mood. When its time to retire for the evening, you'll have four bedrooms to choose from. The master is outfitted with a king bed while there are two queens and a couple of single beds spread across the other three bedrooms. Feeling adventurous? You'll find numerous hiking and biking trails nearby. If hiking & biking isn't your thing, the property has you covered with Heavenly, the casinos, tons of restaurants and shops, and Lake Tahoe all within 15 minutes. > This home sits in a quiet (mostly residential) neighborhood and therefore extra consideration should be made to keep the noise down. > We have a strict no party policy, the registered guest will need to be 25+, excessive use of the property/ extra cleaning required/ failure to follow checkout procedures/ breach of rental agreement will result in steep additional charges. 1Lakeland Village Beachfront 1 BR Beautiful Condo - No Stairs! You can't get any better than this with location! The beach is less than an easy 5 minute walk from the condo. This privately owned condo at Lakeland Village is located in the tourist accomodation area close to shopping, dining and entertainment. This 19 acre property borders 1000 feet of sandy beach. Here you will find amenities galore such as sandy beach, tennis courts, fitness center, saunas and a year round heated pool and spa. This beautiful one bedroom suite is upgraded with granite counters, tile floors and a free standing gas fireplace. The sliding glass doors in the living and bedroom open up to a covered deck with a tree view. The lodge building has heated hallways, elevators and sub terrain parking. Enjoy a nice stroll around the wooded grounds on the paved trails. This home comes fully furnished with a sofa sleeper allowing 4 to sleep comfortably. Condo comes fully equipped with mini kitchen, refrigerator, stove, oven, microwave, plates, utensils, etc. There is a coin operated washer/dryer right down the hallway. NOTE: This condo does not have a pool or lake view. Note: This home does not have a lake or pool view. Enjoy the accommodations of a major resort in our comfy 1BR unit! 19 wooded acres including 1/4 mile of private beach. Relax in 1 of 2 hot tubs, dry saunas, fitness center & three swimming pools. Lakeland Village Resort sits on the south shore of Lake Tahoe, just one mile from Heavenly and within walking distance to restaurants (from fast food to casual to fine dining) parks, shopping, and the Ski Run Marina. The location is truly unique in South Lake Tahoe and one of the reasons we love staying here. Our warm and inviting unit is located on the second floor of the main lodge, with easy access to the elevators, saunas, fitness center, swimming pool, hot tub and underground parking. A fully equipped mini kitchen is at your disposal for those times you feel like eating in. All essentials such as dish soap, dishwasher packs, sponges, paper towels, and kitchen towels are stocked for your visit. Note: The fridge is a mini fridge, the oven and stove are functional, but small. There is also a microwave and dishwasher. This is not a studio but a true 1BR with a comfortable separate bedroom that has a king sized bed, its own flatscreen TV (HBO and HD local channels included) and opens into a small outdoor balcony/seating area. The full bath and shower is separate from the sink and vanity for a little extra privacy, and there is storage space throughout the condo with three full closets as well as several cabinets and dressers. The living area is furnished with a full sofa (queen sleeper), large arm chair, a second flat screen TV, DVD player, and gas fireplace. Dining space opens to the kitchen and living area, and can seat four comfortably. Free WiFi (password provided at check-in). Towels, toiletries, hair dryer, coffee and tea are all provided, just bring some clothes and enjoy all that South Lake has to offer! We LOVE our cozy little condo and hope you will too! 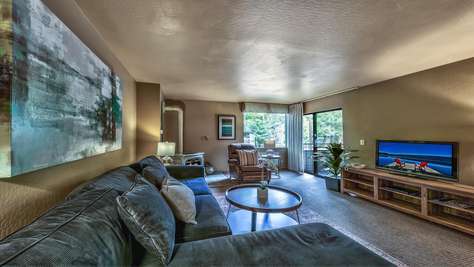 Enjoy the accomodations of a major resort in our comfy 2 Bedroom + Loft + 2 Bath Condo. Conveniently located 2 minute drive to Heavenly California Main Lodge. Enjoy community amenities such as spa, pool, billiards! 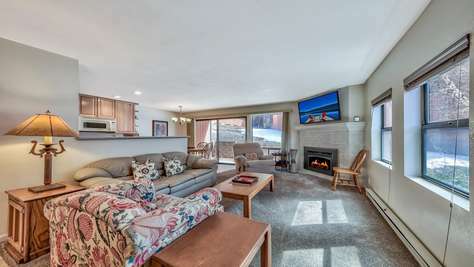 Skiers and riders are in for a treat at this inviting 2BR/1.5BA apartment suite, only a 2-minute drive from the Heavenly California Main Lodge. The advantageous mid-town area additionally puts you near a lot of South Tahoe's attractions. Drive 7 minutes and play disc golf at Bijou Community Park, or lease a watercraft from Ski Run Marina - only 3 minutes away. There are bunches of famous eateries in the prompt region as well! This serene withdraw allures you to unwind in 2 isolate social spaces, the private deck, or at the clubhouse which offers ping pong, a pool table, practice gear, hot tubs and a regular swimming pool. There is secured parking for one auto and one extra vehicle is additionally permitted on a first come first serve basis. 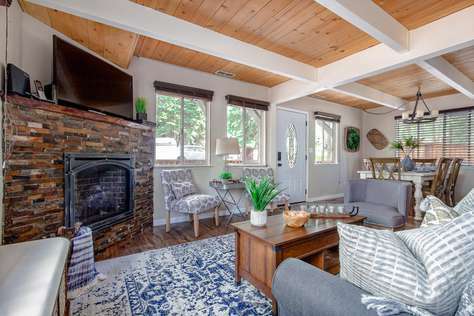 Kick your feet up in the warm and welcoming family room, with a wood-consuming stove and open to seating for 5. In the nighttimes, twist upon the ruler estimate sleeper couch and watch motion pictures on the level screen TV. In case you're bringing the children, they'll cherish hanging out in the second living territory. Concealed on the third story is a spacious loft offering bean pack seats, recreations, and a TV. An all around prepared kitchen comes completely loaded with cookware and basic machines, including a stove/broiler, microwave, dishwasher, and coffeemaker. Steps away, a wooden feasting table seats the entire gathering. Adjacent, sliding entryways open out to a deck zone with outside seating. Following a day of fervor at Heavenly, you'll rest soundly in the unwinding main room with an extra large bed, 32" TV, and perspectives of the pines through the vast sliding glass entryway. The bright visitor room has a ruler estimate quaint little inn drawer wooden dresser. 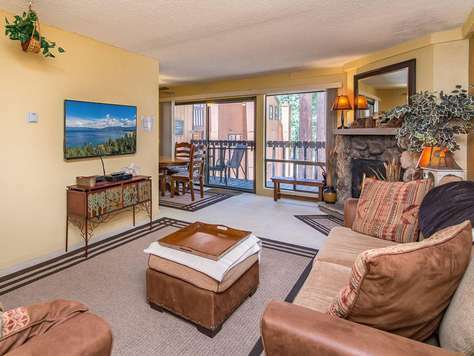 This halfway found condo is only a couple of minutes from Heavenly Mountain Resort. Spend the day cutting up new powder, or in the hotter months take a short drive to the lake for kayaking, parasailing, paddle boarding, water skiing and drifting. You're likewise minutes from a few extraordinary neighborhood eateries. Walk 10 minutes for Bavarian works of art and unrecorded music at Hummel Haus - a relaxed German dinner and brew house. In the temperament for Italian? Drive 2 minutes for a paramount night at insinuates Cafe Fiore. Our property is guaranteed to be up to date. All photographs, enhancements, schedule, and rates are 100% precise. We can inform you when early registration/late registration are conceivable and you'll get the solaces of home with a starter supply of shampoo, soaps, paper items and lodging quality towels and materials. What's more, we make it simple to remain with us! Drive straight to your rental and access the rental with an electronic keyless entry. When you book, we will send you our versatile application with headings, bolt code, and guidelines. We're accessible 24 hours per day with live help. There is secured parking for one auto. Kick your feet up in the warm and welcoming family room. In the nighttimes, twist upon the ruler estimate sleeper couch and watch motion pictures on the level screen TV. In case you're bringing the children, they'll cherish hanging out in the second living territory. Concealed on the third story is a spacious loft offering plenty of space and recreation. An all around prepared kitchen comes completely loaded with cookware and basic machines, including a stove/broiler, microwave, dishwasher, and coffeemaker. Following a day of fervor at Heavenly, you'll rest soundly in the unwinding main room with a large bed, TV, and perspectives of the pines through the vast sliding glass entryway. South Lake Tahoe Castle - Indoor Pool, Billiards, Spa, Steam Rm, Dry Sauna, Fun! Built in 2001, The South Lake Tahoe Castle has been among the most highly rented vacation home rentals in South Lake Tahoe. Thousands of people have stayed here over the years. You will have so much fun enjoying the amenities that you may never even go into town! In the loft we also have a pool table and foos ball table. 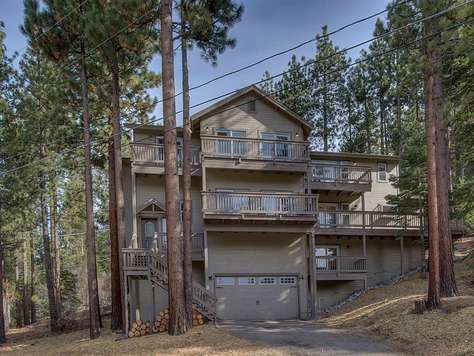 The home is in a beautiful mountain setting surrounded by tall trees, on a quiet cul de sac. It is on a private, spacious lot with lots of space between the nearest neighbors. Please look at the photos of the driveway. 4 WHEEL DRIVE vehicles are pretty much mandatory in winter, all 4WD should also carry chains. To enter the driveway, you must navigate through the very narrow driveway entrance, then go up through a curving steep incline. In the winter, there is almost always a layer of snow or ice on the driveway. Most vehicles that get stuck, get stuck in the middle so it is not recommended that you stop in the middle portion of driveway. Either drive to top of driveway, or stay at the bottom of driveway. 2WD cars should not come to this property December 15- April 1. We have shovels, please help yourself if you need help getting into the garage. On top of this difficulty to get up our driveway and garage, it is important to understand that our street is on a cul de sac. It is all uphill to get out, and is among the last streets to get plowed by the county. You may easily get stuck on the street trying to leave if you are not fully prepared with a good 4WD vehicle. During a major storm, it may be next to impossible to leave our street until the snow plows come through our street at least once. Although our maximum allowed parking is 4, it will be very difficult, close to impossible to get more than 3 cars to fit easily on the property in winter. During December 15 to April 1, we are not allowing more than 3 cars on our property due to all the snow that builds up, and the very high snow banks that makes our driveway even more narrow. Our private snow plow service will not plow the driveway unless it is empty. On days of heavy snow, we strongly recommend keep 2 cars in garage, and 0 cars on driveway otherwise you may need to remove driveway snow on your own with our shovels. It is very illegal to park on the street at all times, especially in the winter due to constant snow plowing. You will receive a very expensive citation and will be towed. Maximum Occupancy: 10 adults, 2 kids 5 and under (total 12 max with kids 5 and under). Maximum Parking: (4 allowed by law, but realistically only 3 can easily park) 3 cars should have 4 wheel drive or chains during winter months. 1 in driveway, 2 in garage. Absolutely no street parking is allowed by law. Guests may not exceed maximum allowed by law for even 5 minutes. For your next mountain adventure, book this cozy 2 bedroom, 1 bathroom house in a calm, quiet forest neighborhood. The home is great for a small to medium group of up to 6 people. 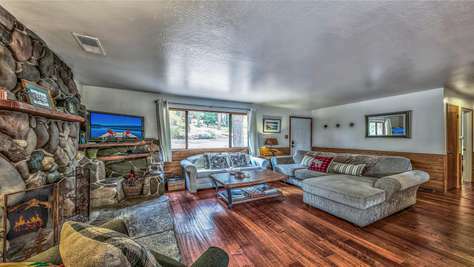 The home is located near Pioneer Trail which is the fastest road to get to places in and around South Lake Tahoe. Head over to a short 10 minute drive to Heavenly Ski and/or the casinos at Stateline Nevada, or Sierra at Tahoe Resort which is 20 minutes away. Several other world class ski resorts are an easy drive away. During the summer, the drive to the beach is 10 minutes away where you can go boating, jet skiing, or hang out on the beach. This home is a great find at a great price for a great mountain getaway. 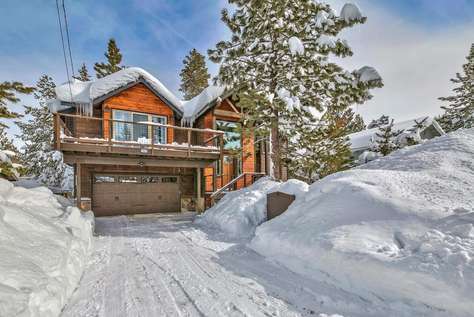 Beautiful and spacious Classic Tahoe House. Beautiful newer custom home in the Christmas Valley area of South Lake Tahoe overlooking Forest Service land with mountain views! New listing with wide open calendar - HUGE discounts!!!! Prices will go up significantly soon. Be among the first to enjoy this home. The upstairs great room is quite spacious and has vaulted ceilings, rich hardwood flooring, a gas fireplace with a log mantle, and beautiful forest and mountain views. The kitchen features granite slab counters, dark stained knotty alder cabinets, pantry, a gas cooktop, and stainless steel appliances. The master bedroom also has forest/mountain views, a walk in closet, a private master bathroom, with custom tile work, and a jetted Jacuzzi tub. Downstairs has 9 foot tall ceilings, includes 3 spacious guest bedrooms, a guest bathroom, and a family/game room with a wet bar, mini-fridge, and a flat screen TV. 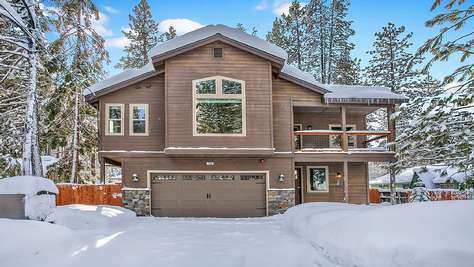 This home is located near miles of hiking/biking trails, the Upper Truckee River, Sierra at Tahoe and Kirkwood Ski resorts nearby as well as Heavenly. You will absolutely love this home! * Legal Parking for 4 cars. 2 cars on driveway and 2 in garage. No street parking allowed. * This home sits in a quiet (mostly residential) neighborhood and therefore extra consideration should be made to keep the noise down. * This home will be stocked with a starter set of consumables such as soaps and paper products and 1 large towel and wash cloth per guest. Guests are advised to either bring or purchase additional after arrival. Laundry detergent is not provided. * We have a strict no party policy, the registered guest will need to be 25+, excessive use of the property/ extra cleaning required/ failure to follow checkout procedures/ breach of rental agreement will result in steep additional charges. *WE ARE IN THE 1% OF HOMES WITH CENTRAL AIR CONDITIONING !!! * Notes on AC: Top Floor 5 Bedrooms Only Have Central AC blowing through vents. Lower floor vents do not blow AC however should be comfortable since heat rises and bottom floors are normally considerably cooler. 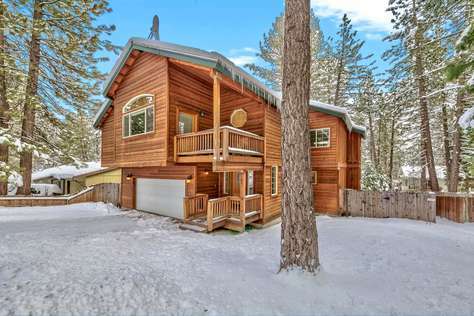 Glen Eagles Manor is the perfect South Lake Tahoe vacation home for large family and friend gatherings. This multi-level rental has 7 bedrooms and 3 full bathrooms, 2 half bathrooms, making it capable of accommodating up to 20 guests. Don't forget to bring your pup along too, this home is pet friendly! There is plenty of space for your vehicles and lake equipment with the 2-car garage and expansive 3-car driveway. Vacationers are sure to enjoy the prime location just south of the lake at the cradle of Washoe Meadows State Park. The secluded location offers peace and quiet as it is surrounded by a forest of lush pine trees. The inside of this Tahoe getaway is furnished with modern decor and furnishings, offering you a luxurious cabin experience. The main common space is comprised of the living room. An oversized leather couch is placed around a gorgeous stone fireplace and mounted flat screen TV. Set a cozy ambiance on a chilly night by lighting a fire and curling up with a good book. Alongside the TV, WIFI is provided for your entertainment. If you are in need of further entertainment, head to the game room. The game room is complete with a full-size pool table, flat screen TV, and lounge area. Spend time with your loved ones over some friendly competition. Behind the main living room is a gourmet kitchen. This kitchen is fully equipped with updated stainless steel appliances and plenty of granite countertops. Your group will love whipping up scrumptious snacks and mouthwatering meals in here. A BBQ is also available right outside on the deck. 3 guests can keep the chef company in the kitchen by taking one of the three seats at the built-in breakfast bar. In addition to this seating, the formal dining table has seating for 10. A breakfast nook is also tucked away featuring bench style seating. Call everyone over to eat a home cooked meal together. Eight bedrooms are available to give you a good night's rest. The master bedroom is furnished with a King-size bed, fireplace, flat screen TV, private balcony, vanity, and an attached master bathroom. The master bathroom calls for a peaceful morning while you soak in the jacuzzi bathtub. There is also a walk-in shower and dual sinks. The first guest bedroom is similarly arranged with a King-size bed, TV, and attached guest bathroom with a walk-in shower. The second and third guest bedrooms both hold Queen-size beds, TVs, and balconies. A jack-and-jill guest bathroom is available with a shower/tub combo. The fourth guest bedroom has two Queen-size beds, a fireplace, flat screen TV, and private balcony. This bedroom has access to a half bathroom. The fifth guest bedroom is ideal for a small family with a Queen-size bed, Twin-size bed, and flatscreen TV. The sixth guest bedroom is suitable for housing any children with two Twin-size beds and two Twin-size rollaways. The last bedroom is located within the second floor den. There is a Queen-size pullout sofa sleeper, fireplace, and balcony. If you notice any of your guests have gone missing, they are likely outside on the back deck. The back deck holds a private hot tub great for stargazing from at night. A washer and dryer are tucked away back inside, handy for wet swimsuits. A sauna is also placed for you to relax after a day of skiing or snowboarding. - This home will be stocked with a starter set of consumables such as soaps and paper products. Guests are advised to either bring or purchase additional after arrival. - Pet fee is $105 for up to 2 pets. Some listing sites will collect this in advance, some will need to pay after the booking. Please make sure you inform us what type of pets you are bringing when placing your booking. - Please no Saturday check ins or check outs allowed without special permission in advance. Friday and Saturday night stays must be booked together, however if a Friday is already booked, you may book a Saturday night check in or out without special permission. Beautiful BRAND NEW custom home in the Meyers area of South Lake Tahoe with breathtaking mountain views! New listing with wide open calendar - HUGE discounts!!!! Prices will go up significantly soon. Be among the first to enjoy this home. The upstairs great room is quite spacious and has vaulted ceilings, rich hardwood flooring, a gas fireplace and beautiful forest and mountain views. The kitchen features granite slab counters, a gas cooktop, and brand new stainless steel appliances. The master bedroom also has forest/mountain views, a walk in closet, a private master bathroom, with custom tile work, and a jetted Jacuzzi tub. Downstairs includes 3 spacious guest bedrooms and a guest bathroom. 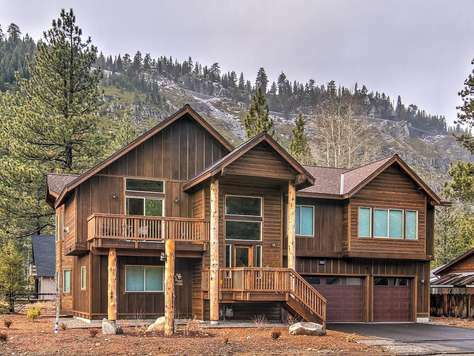 This home is located near miles of hiking/biking trails, the Upper Truckee River, Sierra at Tahoe and Kirkwood Ski resorts nearby as well as Heavenly. There are also 2 golf courses that double as snowmobile tracks in the winter located within 1 mile of the home. You will absolutely love this home! * Maximum legal parking for 4 cars. 2 cars on driveway and 2 in garage. No street parking allowed.